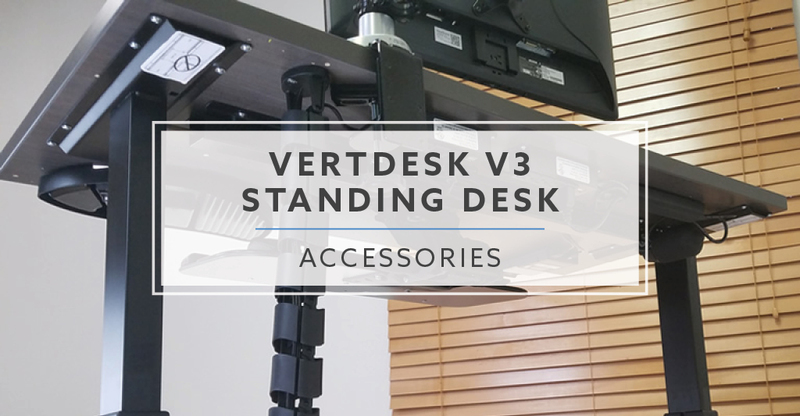 Today we will be taking a closer look at the accessories offered on the VertDesk v3. Selecting accessories that will help create a better ergonomic posture is highly recommended. Many customers assume that the switch to a standing desk means they are now ergonomically correct. Unfortunately, the same issues that exist seated will also exist while standing. From monitor arms to keyboard trays, there a handful of items to choose from. Below we will explain the differences between each and what the benefits are. 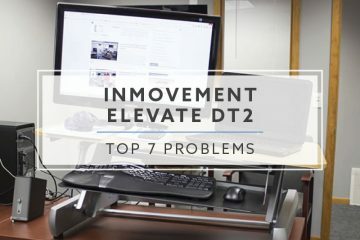 Why consider monitor arm or keyboard tray? The first thing I would like to talk about is why you should consider a monitor arm or keyboard tray. One of the key components of an ergonomically correct workstation is the height at which you type and view your monitor. Having the correct separation will make a world of difference on your body over time. 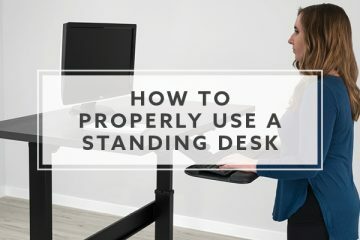 With the flexibility of a standing desk, many customers are finally able to get their monitor or keyboard to a correct height. Unfortunately, that will leave the other too high or too low. Being able to separate each is why a monitor arm and keyboard tray are so important to your ergonomic setup. Monitor arms will provide you with the best viewing angle, raising the monitor up from your desk surface. They will also free up valuable real estate on your surface, with much smaller footprints than the stock base included in the box. We have pre-selected four of the most popular monitor options. They are broken into two types: basic and premium. The main different between them are how easily they adjust. The basic requires loosening a collar, making the adjustment, and then tightening the collar. The premium uses a spring system that is much more user friendly. You are able to grab the monitor and make a quick adjustment, without having to use knobs or levers. Tip: For most users, monitor adjustments are set it and forget it. We recommend the basic for cost savings. They will provide a slightly more stable option as well. Please note that your monitor must be VESA compliant to work with our arms. If you do not have a monitor arm, a keyboard tray could provide the proper separation between where you key and view your monitor. 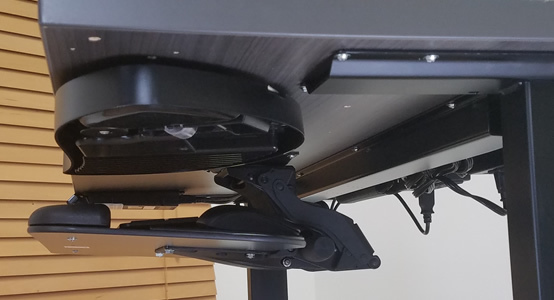 Similar to the monitor arm, they will provide a space saving bonus, moving your keyboard and mouse off the desk surface. For shorter users, you are able to move your keyboard and mouse even lower than the desk surface. This can be as low as 22-23” for the VertDesk v3. I personally like my keyboard tray because I am able to create a comfortable tilted position; the wrist pad is also more comfortable than my desks hard surface. 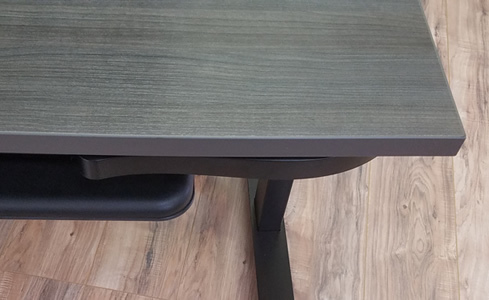 We have selected three options for the VertDesk v3: basic, premium and trackless. Similar to the monitor arms, the basic and premium are classified based on ease of adjustment. The basic model will require the loosening of a knob to make height and tilt adjustments. The premium system is able to adjust by grabbing the tray, tilting upward and then moving to your desired height. The premium will require you to rotate the knob to make your tilt adjustments. 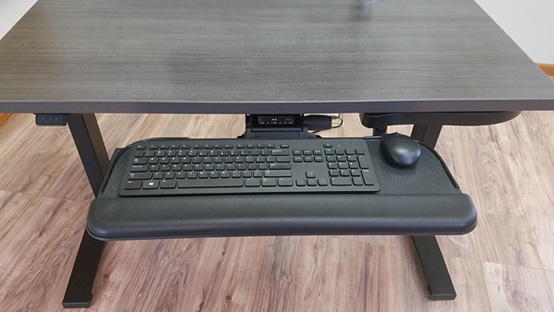 Our trackless system is new and provides an option for customers with a 24” deep VertDesk the ability to add a keyboard tray. Unfortunately, 24” deep desks are too shallow to mount the basic and premium keyboard trays. Tip: I recommend the premium keyboard tray for customers who will be making a lot of height adjustments. Having to loosen the knob on the basic tray is time consuming and can become an annoyance. I find myself making adjustments to the height of my keyboard frequently. CPU holders will allow you to free up additional space on your desk. 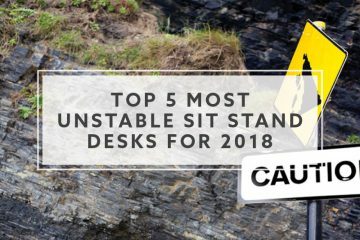 Because they attach to the underside of the desk, it will move up and down with your desk. If you were to set your CPU on the ground it will require longer wires and they could potentially pull out of the back of the CPU. We currently have one CPU holder option for all VertDesks. It provides a great value, is very secure and easy to attach to the desk. It will fit all of the VertDesk sizes. Standing desks are very minimalist. If you are switching from a traditional desk, you will be losing a lot of storage. One option is to use a mobile pedestal file that will provide extra storage and the flexibility to move it around easily. We currently have one option available from OFM. We will be introducing a new file that attaches to the underside of your desk. This will have the option to match the face with the color of your desk surface. It will be available June 2017. The OFM file cabinet is from a different manufacturer, so it is important to note the colors are not an exact match. 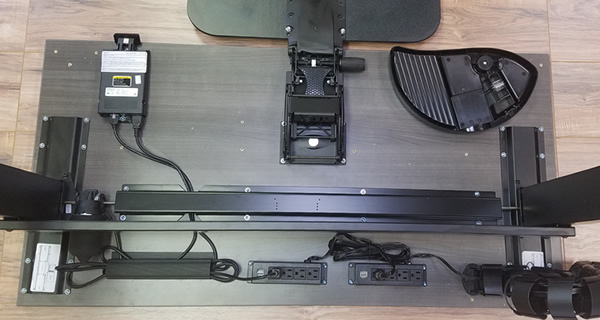 The VertDesk v3 comes with a small amount of wire management that is mostly designed to hold the wires for its own electronics. 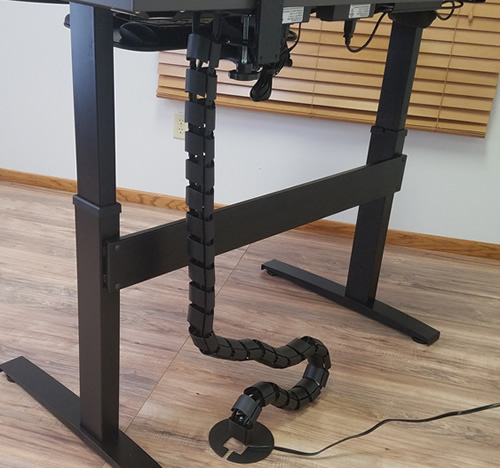 If you will have additional wires that run from the top of your desk to the ground we recommend our snake wire management. If you do not have a lot of wires running to the floor, it is not a good option. Tip: You can also use zip fasteners to consolidate all of your wires. This is a less expensive option to provide some wire management. I recommend adding the power strip option, which is shown below. The power strip is perfect for reducing the amount of wires running from your desktop to the ground or wall outlet. By adding one or two of these you are able to clean up most wire management issues. 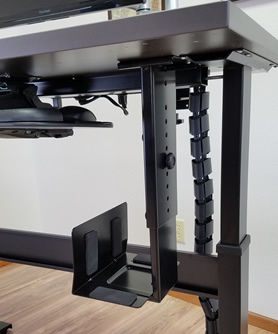 We specifically designed this product for use with standing desks, using a flange system that securely mounts to the underside of the desk. This makes it easy to attach and very secure. Most alternatives do not provide a good way to mount the power strip. It includes four grounded plugs and two powered USB plugs. Tip: For customers that require more power receptacles, you can easily daisy chain them together. This way you only have one cord running up to the bottom of the desk. The swivel drawer option will provide another option for storage. It is not very large; however, it will store pens, pencils, paper clips, etc. 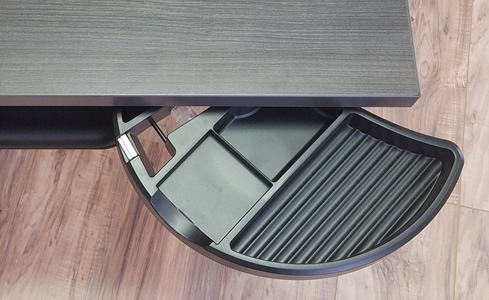 This option is low profile and if you have a keyboard tray, we recommend mounting it on either end of the desk. 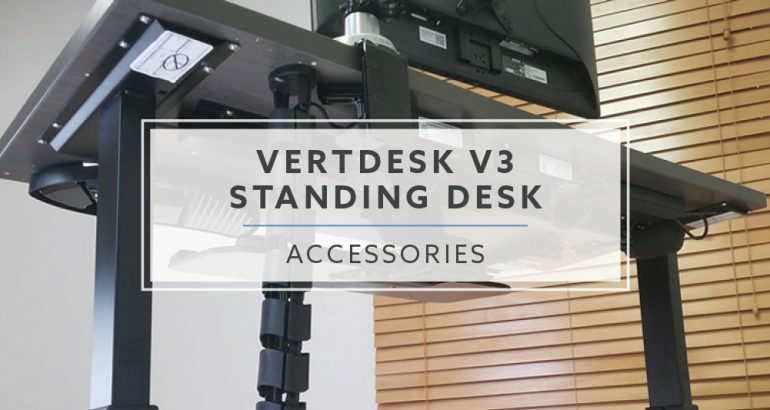 Hopefully my post will help make sense of the accessory options for the VertDesk v3. Not all accessories are a good fit; in fact, some might choose to go without any of them. I would suggest at the very least to consider a keyboard tray or monitor arm. If you have experienced neck or shoulder issues in the past, they could significantly improve your posture. Remember, just because you made the switch to a standing desk, doesn’t mean you are ergonomically correct.